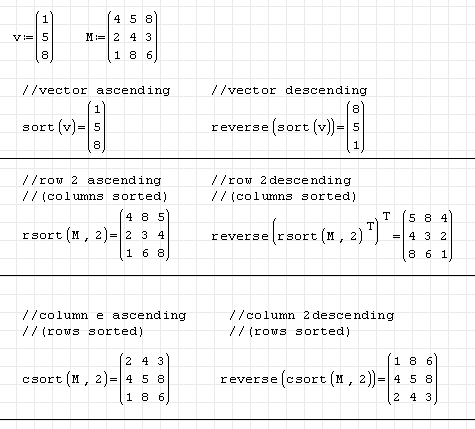 sort('vector') - Returns a 'vector' with the values sorted in ascending order. rsort('matrix/vector','number') - Returns a 'matrix/vector' formed by rearranging columns until specified row,'number', is in ascending order. csort('matrix/vector','number') - Returns a 'matrix/vector' formed by rearranging rows until specified column,'number', is in ascending order. reverse('matrix/vector') - Reverses the order of rows in a matrix, or of elements in a vector. HINT: 2D plot can be represented as two-column matrix. The first column is x-vector and the second is y-vector. 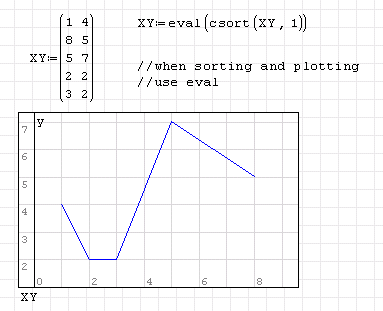 If we want to sort this matrix first and then plotting, we need to use eval.